It crossed the dawn-lit French countryside in eerie silence and the early-rising farmers stood in their fields and stared at it in wonder. At first they thought it was a giant hot-air balloon on fire and about to crash. As it swooped low over the skies near the village of Alencon it began to whistle, slowed, rocked up and don as if it were out of control, and then plummeted down onto the top of a high hill. The grass and shrubbery burst into flames from the heat of the object and crowds of farmers and villagers rushed up the hill to fight the fire. When they reached the summit, they stopped. The fiery sphere appeared to be some kind of mechanical contrivance and a door on its side suddenly flew open. A man stepped out and looked around uneasily at the gathering crowd. Later the witnesses described him as looking “just like us, except that he was dressed in strange clothes…very tight fitting garments.” The man mumbled something that no one could understand, then he ran into some nearby woods and disappeared. He was never seen again. A few minutes later, his odd vehicle exploded in complete silence and nothing was left except granules of metallic powder. A few days later, Paris sent a police inspector named Liabeuf to the site to investigate. He found that the eyewitnesses included two mayors, a physician, and three other local authorities in addition to dozens of peasants and farmers. Something very unusual had apparently happened at Alencon but it was never reported to the French Air Force. And for very good reason. On the morning of June 12, 1790. There were only three or four hot air balloons in the entire world at that time. (The first balloon had been sent up by the Montgolfier brothers only eight years earlier.) What and who did these Frenchmen view on that distant date? Many of the details in Inspector Liabeuf’s report are uncomfortably similar to modern “flying saucer” accounts. If this same distinguished group of witnesses were around in 1968 and reported something like this, they would have been branded “contactees”, subjected to ridicule, and the French Air Force would probably have explained the UFO away as “a weather balloon”. Unidentified flying objects have been turning up throughout history, and many thousands of people clain to have actually seen and even spoken with the Ufonauts (pilots). Not all of these people can be lumped into the category of “kooks, cultists and crack-pots.” Their constantly growing ranks include judges, senators, doctors, lawyers, engineers and hard-boiled newspapermen. A good many of these witnesses understandably choose to remain silent about their experiences because so much controversy and ridicule has been heaped upon those “contactees” who have dare to publicly reveal their encounters with the people who ride around the flying saucers. “People” may be the right term, for in many reports the Ufonauts are described as looking just like us, with human features and an apparent ability to breathe our atmosphere without difficulty. But there is also a spate of stories involving “little men” in “diving suits” and “giants” in “space suits” complete with transparent helmets. “Contacts” with the flying saucer pilots have now been reported from every country on Earth, including the Soviet Union, and since very few of these stories are widely publicized or circulated, it is remarkable that so many witnesses so separated by distance could come up with the same correlative details. It is easy for us to dismiss the single reports as being the work of liars and cranks but in the past 20 years over 2,500 such stories have been carefully investigated by trained scientists and reporters on every continent. And historians have unearthed hundreds more going all the way back to ancient Roman times. The sightings of the flying saucer themselves (there are now over 100,000 fully documented sightings from all over the world) pall into insignificance beside this mass of data about the UFO occupants. Deep in East Africa, the residents of the tiny village of Baira, Mozambique reported an incident in April, 1960 which is almost identical to that 1790 “touchdown” (landing). According to the story filed by the Portuguese news service Lusitania, hundreds of villagers saw a whistling orange objet land in a field outside Baira and a group of “tiny little men” leaped out of it and ran into the forest just as the thing exploded. Searcher could find no trace of those “little men”, either. The objects and their pilots have an uncanny way of disappearing without leaving any evidence behind and it is this absence of hard physical evidence which keeps the anti-UFO scepticism alive. Since the flying saucers and their peculiar occupants have apparently been busy in our skies since the beginning of history (there are extensive UFO descriptions in Hindu scriptures dating back 5,000 years and, of course, there are several UFO like accounts in the Holy Bible), it seems unlikely that they will ever provide us with concrete evidence or enter into formal and open contact with our governments. The UFO buffs have been waiting patiently for twenty years now, hoping that one day soon a flying saucer will land n the White House lawn or settle in front of the U.N building. This will probably never happen. Indeed, if some of the UFO pilots look just like us, there is no need for this to happen. They could easily walk our streets and even move into our apartment building without ever being noticed. And it does seem as if they want it that way. Sure, this sounds like a bad plot from the TV series, “The Invaders.” But, to coin a cliché, fiction is always struggling to keep up with fact. In 1866, a man in Massachusetts named Willian Dention announced that he was in contact with beings from other planets. He said they looked just like us, could speak our languages, and they flew through the skies in saucer-shaped machines made from aluminium. (The commercial process for manufacturing aluminium was not developed until 1886) Mr. Danton also explained that they could communicate silently via mental telepathy. Needless to say, not very many people took these startling revelations seriously. There have been other “contacts” in 1823 and 1846 but of course nobody paid much attention. In March and April 1897, thousands of people all over the United States reported seeing gigantic cigar-shaped machines in the sky (this was long before any kind of dirigible had been successfully flown in the U.S), and many told of landings and casual chats with the pilots. What did these pilots look like? Fortunately, there were hundreds of extensive newspaper stories on these incidents throughout the period and UFO researcher have burrowed into the old files and come up with hundreds of interesting items. The pilots of the 1897 “airships” were slight in stature, had dark olive skins, deep black eyes and long fingers. They spoke perfect English, according to the witnesses. Not all of the UFO occupants are male, either. There are many stories of “beautiful ladies” alighting from the objects. An ex-Senator named Harries, from Harrisburg, Arkansas, testified that a strange flying machine landed on his farm early on the morning of April 21, 1897, and that two men and a woman stepped out to draw water from his well. A week earlier, a similar object allegedly landed on a farm near Springfield, Illinois, and two men and a woman disembarked from it briefly to chat with Adolph Winkle and John Hulle. Both farmers later signed notarized affidavits swearing to the truth of their story. A pair of Arkansas lawmen, Constable John J. Sumpter and Deputy Sheriff John McLemore, also signed sworn affidavits claiming that they saw a luminous object land on the night of May 6, 1897, in Garland Count Arkansas. They said that two men and a woman appeared and filled a sack with water from a well while they watched. In all three of these cases, one of the men was said to have sported a waist-length beard of “silken” whiskers and acted as the spokesman. Bearded Ufonauts were also reported by a large group of witnesses at Bell Plains, Iowa, and April 15th of that year. There were scores of other contacts in 1897, and hundreds of detailed aerial sightings. The objects themselves flew low over Chicago, Ill., Omaha, Nebraska; San Francisco, Calif. And even Washington, D.C. They were viewed by thousands of people. When all of these reports were sifted and organized by dates it was obvious that many “airships” were involved, for they appeared simultaneously over dozens of localities on a single date. There are now many hundreds of “little men” reports from all over the world. In the majority of these, the witnesses describe the creatures as having Oriental like eyes, lipless slit-like mouths and long, slender hands. They seem to share these physical characteristics with the taller (usually 5’9”) Ufonauts who have now been reported in abundance, particularly in North and South America. The beings who purposely abducted Betty and Barney Hill in New Hampshire in 1961, were described by them as being less than five feet tall and having “wrap-around” eyes. Usually they are said to be dressed in tight-fitting black coveralls or in “silver” suits. Occasionally there have been reports of green-suited creatures and early reports of such types gave rise to the “little green” men stories. In approximately 80? of the known cases, tall and short, the Ufonauts have been described as having dark or olive complexions. Where all of these “people” are coming from is a complicated part of the mystery and there are no real clues. We can only note that they seem to reappear consistently in the same isolated and thinly populated areas year after year. Michigan, Minnesota and Arkansas had hundreds of sightings in 1897, and the objects were back in strength in the same areas throughout 1966-67. In some areas, UFO sightings can be traced back hundreds of years and it almost seems as if it is a local phenomenon. Why, we must ask, would beings from another planet travel to the dust bowl of Oklahoma year after year, century after century? Local Indian legends of the “Sky People” go back many centuries. The many “contact” reports and creature sightings, sometimes involving dozens of witnesses, mean that we must exclude purely natural causes for the phenomenon such as “ball lighting”, meteors, weather balloons and the like. The objects are obviously manned and how we know a great deal about those occupants, although we still don’t know enough. We also have very good reason to believe that there is a group or organization of people living amongst us who do not want us to find out what is really going on. For years, the UFO buffs believed that the Air Force and the CIA were working to harass UFO witnesses and suppress information. But this myth has been exploded in the past two years. It would not only be very expensive and require a lot of personnel for any government agency to track down UFO witnesses and scare them into silence, it would be also quite unconstitutional and self-destructive. The US Air Force now admits that they have been trying to catch the unknown persons who have masqueraded in Air Force uniforms and threatened American citizens, sometimes only minutes after those citizens had observed a UFO – and before they had the chance to report their sighting to anybody. The Air Force now quietly hands over UFO cases to the FBI not to harass the witnesses but to find out who is harassing them! The contactees in particular have been allegedly subjected to all kinds of harassment in the past But most have suffered in silence, whispering among themselves about the “government agents” who tap their phones, tamper with their mail and follow them doggedly in gleaming black Cadillacs. Those who have managed to get a good look at their pursuers have usually described them as being either “Short, stocky men in grey suits” or “dark complexioned men, about five feet, nine inches tall, with high cheekbones and angular face, dressed in black suits.” In essence, they are unwittingly describing the known characteristics of the UFO occupants themselves! Are there two groups involved here, both of the same racial origin but in conflict with each other? The testimonial evidence seems to indicate this. One group seems to be trying almost desperately to gain our attention, while the other group is working equally hard to suppress the witnesses and keep down the flow of information from their “enemy”. The government and the Air Force may be caught in the middle and, thanks to the skillful manipulations of the suppression group (who pose as Air Force officers, etc.) are inadvertently being blamed. The UFO buffs have blandly simplified an extraordinarily complicated situation. They have been propagandizing for years, trying to tell us that “superior extraterrestrial intelligence with an advanced technology” is “surveying” our planet and making plans to land and save us from ourselves. If It were not for the extensive historical documentation, we might be able to believe that the “flying saucers” are really some secret device from the U.S or the Soviet Union. But this has been going on for too long. The date simply does not fit these over simplified concepts. Something else is happening here. Something very frightening. Let’s consider a single heavily investigates and well documented case which recently made headlines, although the newspaper stories were superficial and the full facts are being revealed here for the first time. The hero of this bizarre story is a rugged 29 year old farmer named Caroll Wayne Watts; a man who enjoys an impeccable reputation for noesty and integrity in his hometown of Wellington, Texas. At 10:30 p.m. on the night of Friday, March 31, 1967, Watts was working around his barn when he noticed a light moving near an abandoned house belonging to his uncle a short distance away. Suspecting that thieves or trespassers were up to no good, he jumped into his car and headed for the building. As he drew closer to the light, he was startled to see that it was part of a cylindrical object about 100 feet long and 8 or 10 feet high. He got out of his car and approached the machine, which appeared to be hovering two or three feet above the ground. “Suddenly, a door that I hadn’t detected before slid open, something like an elevator door,” he said. “And that was when I began getting scared; though somehow I just stood there, looking into this opening. Inside there were no crew or anything, just machinery and all kinds of meters and dials, lit up by a strange bluish light. “They pointed out a machine against the opposite wall from where I was standing.” he continued. “They said all I had to do was stand before the machine to take the physical…About two or three feet from the machine was a map. It was about a yard square and began about a foot from the floor. It appeared to be a large scale land map but I couldn’t tell what it was a map of. “They – whoever “they” were – said they were stationed all over the world and could come and go as they pleased; no one could stop them. When I declined the physical, they told me that several people had taken the test and made flights. Mr. Watts left the object hurriedly and abandoned his car, leaving it with its motor running to hurry back to his farm on foot. He told his wife the story and decided to call his cousin, Don Nunnelly, who happens to be the Chief of Police in Wellington. Both Nunnelly and Colingsworth County Sheriff John Rainey drove immediately to Watts’ farm and they all went to the site. The object gone but Watts’ vehicle was still there, its engine running. Preposterous though it may seem, Caroll Watts’ story is not an unusual one. Over the years many witness have claimed identical experiences. 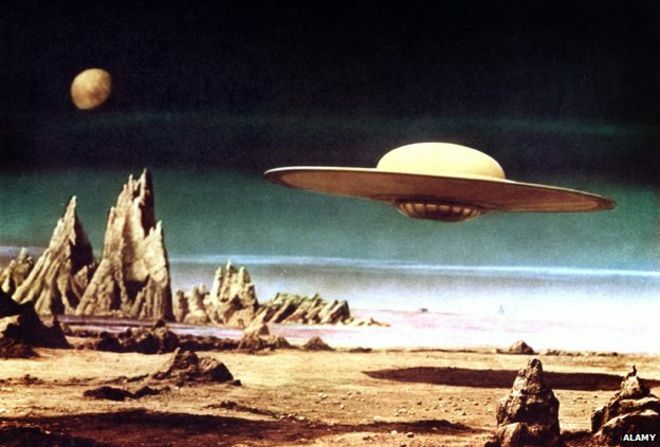 A rocket engineer named Dan Fry became the center of a controversy when he claimed that he encountered a saucer-shaped object one the desert near White Sands, N.M on July 4, 1950, and that a voice invited him aboard and took him for a jaunt across the country. Another technician, A California TV repairman and ham radio operator named Sidney Padrick, reported that a voice also invited him ono a spherical object on a beach near Monterrey Bay early on the morning of January 30, 1965. But Carroll Watts narrative seems to pick up where theirs leave off. Two weeks after Watt’s initial experience, on Tuesday, April 11, 1967, he said he saw another light near his home and this time the engine of his pick-up truck stalled when he tried to approach it. He got out of the cab and found a metallic egg-shaped object hovering directly behind his vehicle. A door opened, he testified, and four small men appeared. They were all less than five feet tall, seemed muscular, had elongated eyes and slit –like mouths which did not move when they spoke. They were dressed in “white coverall type suits.” They addressed him in English he claimed, and asked him if he would go with them. This time he agreed. Watts reported that he was flown to a much larger craft, possibly somewhere in space, where he was examined by some sort of machine which probed his body with wires. He tried to pick up and retain a small cube from a table on board the craft, and the next thing he knew he was back in his truck, regaining consciousness. Caroll Wayne Watts had nothing to gain by making up such a story. Indeed, he had risked his very fine reputation by revealing it publicly. Everyone who knew him supported him. Many other residents in his area had also seen peculiar flying objects, including Chief of Police Alvis Maddox of nearby Childress, Texas who pursued an unidentified flying object for several miles just outside of Wellington on the night of March 2, 1968. Sheriff John Rainey also saw that object. Both men said that it was “a huge bright light” moving over U.S 83 at an altitude of about 500 feet. Dr. Hynek suggested that Watts submit a lie detector test and the young farmer welcomed the idea. On Sunday, February 23, 1968, he started out for Amarillo, where the test was to be administered by the Amarillo Security Control Company. Near Hedley, Texas, on Route 287 he came upon a 1957 Plymouth that was apparently in trouble. A woman stood next to it, looking rather helpless, so he pulled over to the side of the road and stopped to see if he could help her. As he approached her, two rugged men carrying rifles suddenly popped up from under a nearby culvert and threatened him, or so he claimed. Watts said they struck him about the shoulders with their weapons and warned him that if he passed the lie detector test he would never return home alive. It was a very distraught man who walked into the Amarillo Security Control Company that afternoon. Watts submitted nervously to the test but deliberately lied, he declared later, so that the results would be negative. When he returned home that evening he noticed a ca parked some distance away. It began to cruise back and forth in front of his home with its headlights out. He dug out his M-1 rifle, loaded it, and hid behind a storm cellar next to the house. On the car’s final pass there were three loud reports, like shots, Watts claimed. He fired back with his M-1, shooting at the retreating car several times. Then he called the police. Investigators found the spent cartridges next to the storm cellar but there were no marks of any kind of the house. A former Air Force officer, Captain Robert B. Loftin, visited Watts and filed a detailed report with the Aerial Phenomenon Research Organization (APRO) in Tucson, Arizona. Reporters for a small specialized publication, Saucer News, Michael Femora and Richard E. Wallace also investigated. They were all impressed with Watts’ obvious sincerity and the straightforward manner in which he related his incredible story. He passed rigorous cross-examination. Whether or not Caroll Watts actually talked with “little men” from a UFO and submitted to a physical examination almost seems to be a side issue in this case. His story of “contact” contained all of the little known details and correlative factors. His friends, neighbors and the local authorities backed him to the hilt. He managed to convince experienced investigators that he was telling the truth. If the man was making it all up, what was his motive? After the results of the lie detector test were made public he was subjected to considerable ridicule by the press. The story of that test was circulated nationally by the wire services. Watts doesn’t stand to make a nickel from all this. (In fact, contrary to all the myths, none of the “public contactees” have profited from their experiences. The most famous of them all, George Adamski, died broke. But it two men did attack and threaten Caroll Watts, who were they? And why was it so important to them that his story should be ridiculed and not taken seriously? Watts is only one in a long line of UFO witnesses who have suffered in this manner. We have no way f telling how many people were effectively and totally silenced by these tactics. Nor can we guess how long this sort of thing has been going on. Perhaps it all started in 1896, or even earlier. And we are only just now getting wise to the existence of the mysterious “silence group.” Sid Patrick, the California TV repairman, talked freely with newsmen about his experiences back in 1965, but now he has fallen silent and refuses to discuss UFOs with anyone. Howard Menger, a “contactee” who created a sensation with his tales from High Bridge, N.J., in 1956-57, later voluntarily appeared on a national television show emceed by Long John Nebel and astounded everyone by publicly refuting his earlier claims. It was hardly necessary for him to go on TV and tell the world in essence, “I was mistaken – it was all a lie, folks”. Who is scaring these people into taking such drastic steps? If the unidentified flying objects have been present in our skies for many centuries, as all of the evidence indicates, then it is only logical to assume that many, many people have had chance or deliberate encounters with the Ufonauts. Why don’t we hear more about these people? Perhaps it is because that “silence group” has been doing a good job. Men who investigate the UFO phenomenon have also been “silenced” in large numbers. Dr. Morris K. Jessup, a well-known astrophysicist who wrote several excellent books on the subject, committed suicide in 1959. Others have died suddenly or simply disappeared without a trace, such as George Hunt Williamson, another UFO author. Still others, such as Professor Gordon Evans, have abruptly dropped the whole business after years of dedicated study. Why? Are these peculiar people really “stationed all over the world,” as they allegedly claimed? If so, is there another group living amongst us, trying to keep us from finding out? The evidence suggests that the “silence group” not only exists, but they will stop at nothing – not even murder – to accomplish their purpose. The cultists and the UFO buffs delight in talking about “Big Brothers” from outer space who are coming to save us from ourselves. It’s a happy concept, but there’s absolutely no evidence to support it. Instead, we should be worrying about the rifle bearing thugs who are driving along our highways in inconspicuous old cars and the ersatz Air Force officers who are busily confiscating UFO photographs and telling witnesses to keep their mouths shut. Somebody up there loathes us!